A charity has opened a women's centre in Somerset to help turn around the lives of vulnerable women caught up in the criminal justice system. The Nelson Trust's in Bridgwater is helping 150 women and says by the end of 2020 it will reach about 500. The charity said the women came from various vulnerable backgrounds and often have "multiple and complex needs". The trust already helps about 900 women across Bristol, Swindon and Gloucester. 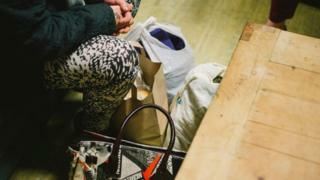 Women are referred to the charity by Avon and Somerset Police at the point of arrest, in a scheme known as project SHE, to help them avoid a charge, court appearance or prison sentence. Aimee Davies, from the charity, said: "They've not got an education, they've never had a job, they may be involved in some criminal activity, they may have been masking that activity with drugs and alcohol. "They're really people who are at the last end of society - they're not seen." She added the centre would help "build the women up" by giving them new skills and offering advice and support. At the moment, the centre is only open for police referrals but will also be a drop-in centre when full staffing is in place. There are also plans to expand its work to Yeovil, Taunton, Frome and other market towns in the county. The £500,000 centre was funded by a local fundraising campaign, charities and foundations including the Nelson Trust, and the Ministry of Justice. Why doesn't prison work for women?